One of the most beloved practical life experiences for young toddlers is transferring with a spoon. There is just something about this simple motion that is so satisfying to these little people. For adults, using a spoon is so common of a task we may not even realize how complicated it can be. A specific set of motions must be used to accomplish our task, and there is very little room for error. 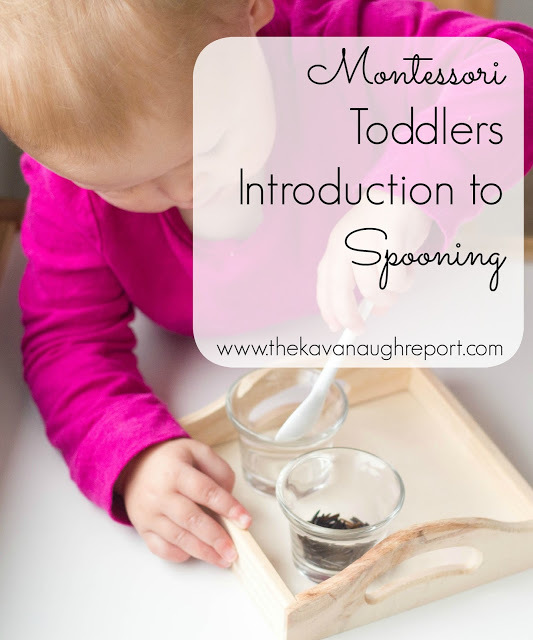 So, an introduction to spooning for Montessori toddlers can be very helpful. Nora's true introduction to spooning, was at 6-months when she first started to eat solids. 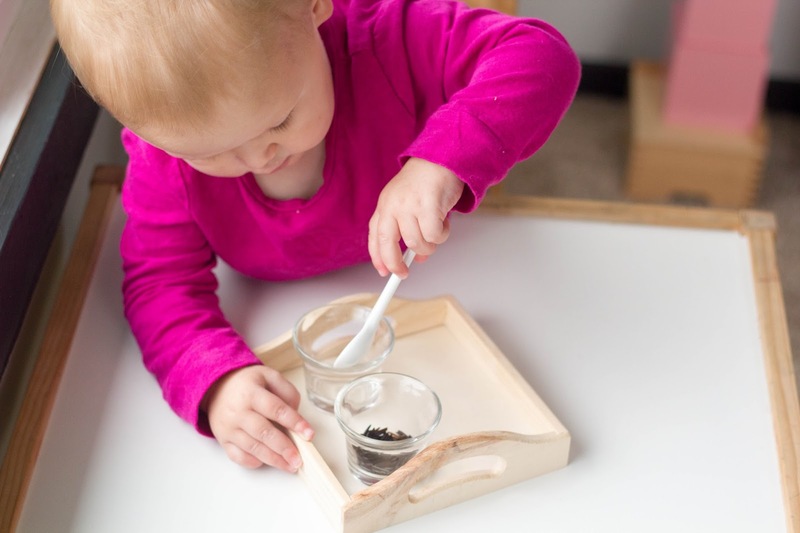 Following a a Montessori-method of weaning, she was given a spoon and fork with every meal. But, this is still a skill that she is refining. So, I still wanted to create a work for her to use away from meal times. However, I should make it clear, that this type of practical introduction should be the main way that toddler are doing practical skills. 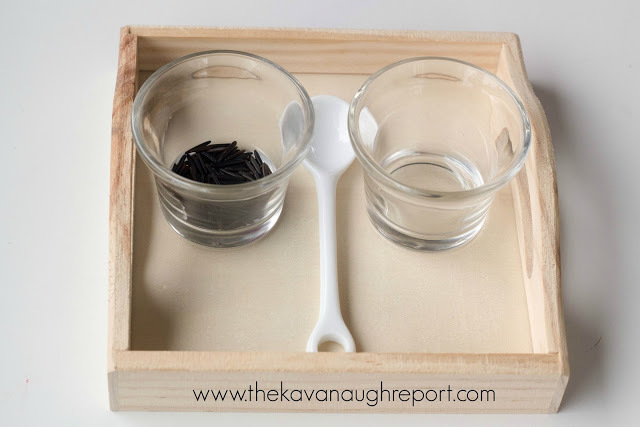 These little trays come second, and should be used sparingly. To make this work, I simply used a small amount of wild rice in a glass cup. I included a small glass appetizer spoon. A tiny wooden tray with higher sides. The tray is small and light enough for Nora to carry to a mat or table. I choose to use food on this tray to make it a true extension of her meal times. I also only included a small amount of rice -- no more than you are willing to clean up! Also, Nora is still very oral, so with the rice, I don't have to worry as much if she puts it in her mouth. If you want to introduce spooning to a toddler, I suggest to keep it very simple and practical at first. Remember it is about the process not the product. After a quick presentation, I suggest letting your toddler explore the tray. 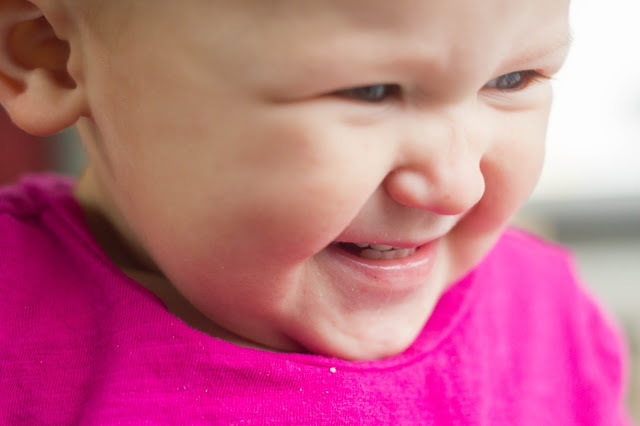 Try to observe instead of reacting, especially if the toddler doesn't do it the same way you would. If a spill is made -- and a spill will happen! -- I encourage Nora to pick up the rice. But, only AFTER she is done spooning. I try not to interrupt her even when mistakes are made. Concentration and respect is key. This also means you should try to avoid praise or help as your toddler works. I know this can be hard. But, trust me. Repeat over and over -- process over product. Then, sit back and watch the joy of accomplishment! Do your children enjoy spooning? 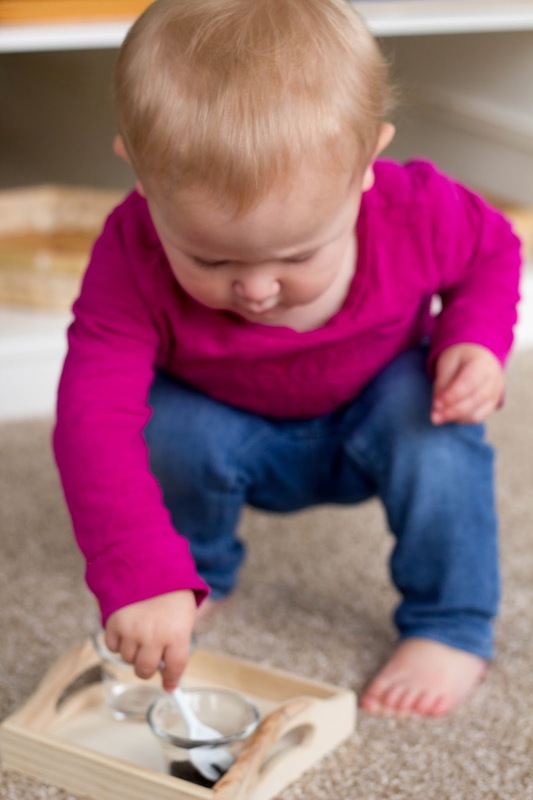 What other practical life activities have you encouraged with your toddler? I love your posts! How old was she here? Can i ask you, what happen i gave my baby a bowl to spoon, something like pasta she was ended up turning the bowl and let the pasta spill and then she will chew the bowl. 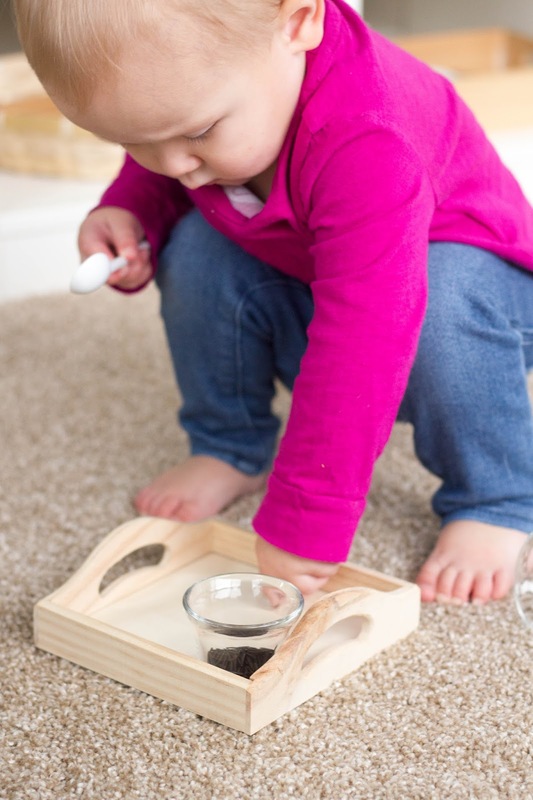 It's challenging to get my baby to sit well and do Montessori activities at home. Thanks for a lovely post, as always!